One of the main key performance indicator of online stores is the conversion rate of purchases. The conversion is affected by many factors, including the site of the store, the range of products, and of course, external factors. The most important of them we will discuss now. Method 1. Start with the site. Design. Well-designed navigation can increase the conversion. Use a / b testing for that. This is the method for determining the most effective web-page (a web-page element) from two options, offered to users. I recommend a service https://www.changeagain.me/ Its main advantages are that a marketer, a specialist shouldn’t have programming skills, the service integrates with Google Analytics, what is very convenient. And you don’t have restrictions on the size of traffic for tests. Method 2. Technical condition of the site. The pages of the site should load quickly, work correctly and don’t give out errors. Users don’t like to wait. You can check the speed of work of the sites, using the Google PageSpeed Tool. In addition, an important role is played by cross-browser compatibility, cross-platform and adaptability for various screen resolutions, desktop computers and mobile devices. The service of https://notifyninja.com/ can help you to track the serviceability of the site. It will inform the administrator about the breakdown by skype, fb messenger and other convenient way within one minute. Method 3. Mobile version and electronic payments. According to the latest research, more than 60% of users are searching for the goods they need from mobile devices. In this case, the buyer wants to make payment quickly and without difficulty. The payment aggregator is important connecting link between customers and successful purchase. Returning to the topic of messengers, your customers spend 80% of their time in chats of their messengers. It is necessary to give them the opportunity to pay for goods within the familiar environment of favorite messengers, skipping the annoying forms. Fortunately, such solution has already appeared, and I can advise you an amazing product – http://tap2pay.me/ . It allows your customer to receive an invoice to pay right inside a chat. Thus, you will have a button “Buy in one click” on the site, and the conversion rate will increase by 20%. Method 4. Online consultant on the site. It’s much more convenient, if a consultant will communicate with customers not in the chat window on the site, but in instant messengers and get instant answers. The tool that will help you solve this problem is Tap2pay.me. This is a platform that opens new channels of communication with clients such as messengers. The service allows your customers to make payments in two clicks, reply in a chat concerning delivery and after-sales service. Method 5. Improve the quality of photo of the product, a description of its characteristics, give more information about the product. When you buy online and don’t see the product, it’s more difficult to make a decision about purchase. That is why the high quality images of product, the detailed description of its characteristics are so important. Method 6: Visualization and involvement. In addition to product images and descriptions, you can help your buyers choose a product in a game format. I’ll explain. For example, if this is a closet, allow your customers to change the placement of shelves, change their size, select the material and color of the doors directly on the site. If it’s clothes, give the chance to upload photos and try on. If it’s a car, give the chance to select color and see, how the car will look, etc. It can also be a differents tests. Reviews, this is what a buyer pays attention to, while choosing a product or service. This is one way to increase trust. 61% of buyers buy goods only on sites, where there are real reviews. You should motivate buyers to leave feedback, offering discounts, pleasant gifts and bonuses. It is equally important to respond quickly and to work with reviews. Reviews should be in a prominent place in the site. Method 8. The ability to test the goods of your online store. One of the best techniques to increase sales is providing an opportunity to try your product. The customer, who tried your product and remained satisfied, surely will make a purchase and, possibly, will enter the base of regular customers. Method 9. Start a blog with useful content about products or ask professional bloggers for help. 42% of customers refer to the articles and blogs to get necessary information about the products. Keep your own blog. Tell us about existing products, how to use them correctly, make reviews, tell us about new products, about the functions of certain products, how to choose the right product. An alternative way is to refer to opinion leaders, to famous bloggers, who write on relevant topics. They can use your product and tell about their positive experience of using. If a product is complicated, it can be webinars, showing how to use it. Don’t forget about remarketing. 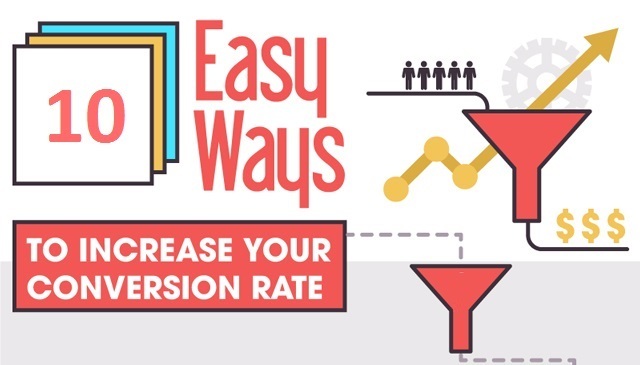 Conversion on average increases by 30-35%. The most important principle nowadays is speed. It’s more and more difficult to attract the attention of users to your site, to your products. First of all, users appreciate the speed and ease of use. I hope these rules will be useful for you and you will be able to increase your conversion.